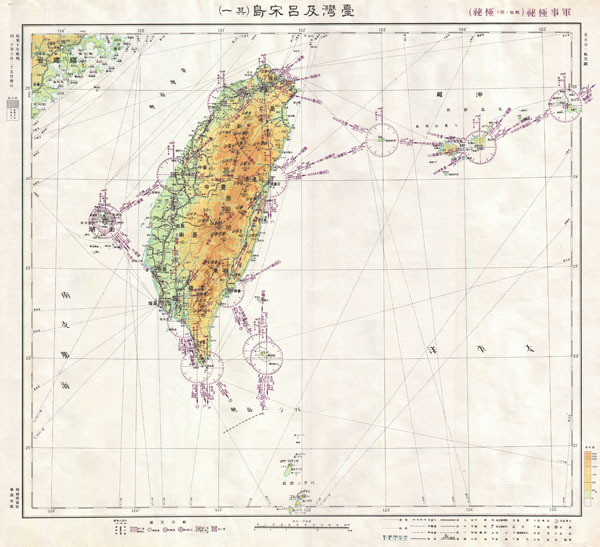 This is a rare World War II era Japanese Aviation map of the island of Formosa or Taiwan. Features the island with superb detail, especially with regard to navigational instructions and topography. Include the nearest Chinese coast as well as nearby islands. All text is in Japanese. This map comes from a collection of material sized by the U. S. Military during World War II. They were sent to the office of General MacArthur in Manila. The owner of this chart headed a unit of Volunteer NISEI translator recruited to translate and de-code documents seized on the Pacific Front. Japanese Military during World War II. Very good condition. No notable flaws. Blank on verso.